The meatballs will soak up all the flavours in the sauce. Towards the end of cooking, some more veggies are added to balance the whole dish. 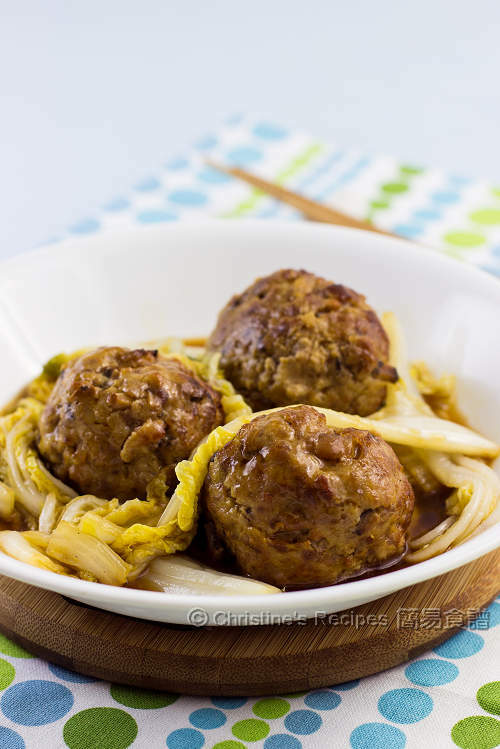 This classic Chinese meatball dish is very suitable for being served as part of Chinese New Year celebration meals. 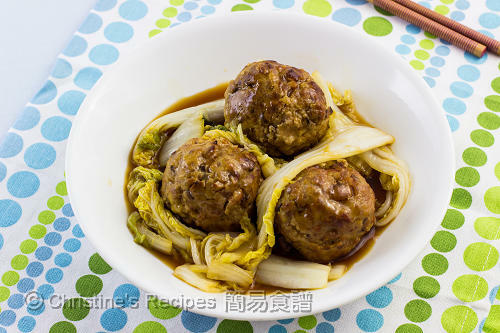 The name of this dish derives from the shape of the meatballs that are supposed to resemble the lion heads and the cabbage leaves the lion's mane. The meatballs are often deep fried and then braised for at least an hour. So, how super-tender the meatballs will be you can imagine. This time I detoured, not using the deep-frying method for the sake of less oil consumption, and baked the meatballs in my convection oven (picture here) to evenly brown them and get them firm quickly. You can use regular ovens without any doubts. By adding a secret ingredient that I learnt from making the Ikea’s meatballs, I managed to recreate this dish with juicy meatballs of similarly fall-apart texture. By doing so, I didn’t need to braise the meatballs for a long time. The dish can be done comparatively quicker than the traditional way. Best of all, the meatballs can be well prepared one day ahead. Whenever you need it, just reheat it and cook with any vegetables you like. A very delicious Lion’s Head meatball dish can be served for your family or your guests in a few minutes. In a large mixing bowl, combine the pork mince, ginger, mashed potato, breadcrumbs, mushrooms, chinese sausage, egg white and marinade. Stir in one direction until springy. Refrigerate for about 25 minutes. Remove the pork mince from the fridge. Divide into 5 to 6 equal portions. Shape each portion into a ball between your palms. (Note: Damping your hands with a bit of water will prevent the pork from sticking to your palms.) Spray or brush some oil on surfaces. Bake in the preheated oven for about 15 to 20 minutes, or until the surface turns brown. Transfer the meatballs into a wok or a heavy-bottomed pot. Pour chicken stock and sauce. Bring it to a boil over high heat. Reduce heat to low. Cover and simmer for 15 minutes. Add the cabbage and cook for another 10 minutes, until the meatballs and cabbage are softened. Add thickening and cook to your preferred consistency. Serve immediately. Mixing in mashed potato helps the meatballs stay soft and smooth. How to make mashed potato: Peel and dice a potato. Cook in boiling water for about 20 minutes. Drain out and mash them with a large spoon or a potato masher. Let it cool down. Measure out the quantity you need and mix with other ingredients. The remaining can be used with other dishes or stored in fridge for later use. The breadcrumbs and egg white can help pork mince combine well. You can use regular oven or pan fry the meatballs instead. 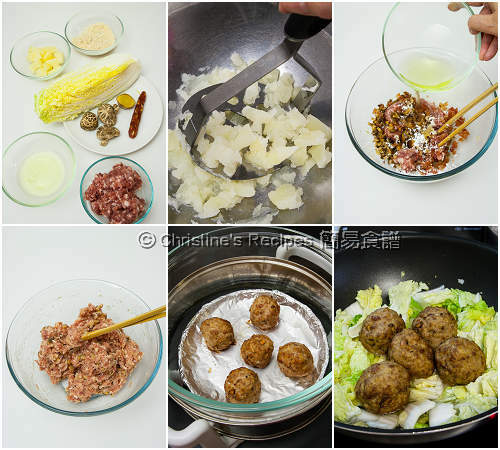 If using pan-frying, the meatballs will be flattened a bit along the way of browning all sides. The taste is still good though. Approx. how many potatoes will make 80gm? I used about half of a potato. Or you might use a very small one. Thanks for sharing this recipe. Bookmarked! looks amazing, cant wait to try this out! Look yummy! Would steaming work as well? I love your recipes. Haven't tested this recipe with steaming. Guess that it might work. hi Christine, I don't have breadcrumb, can i use wheat germ instead? thank you. Sure, you can use wheat germ instead. I, sometimes, make my own breadcrumb with stale bread. Simply process them into crumbs with a food processor after toasting. Hi Christine, how would you recommend reheating the meatballs so they retain the same nice texture? You might try steaming them. It won't get dried by doing so.